I don’t mind baking cookies, as long as I'm not spending all day making them. 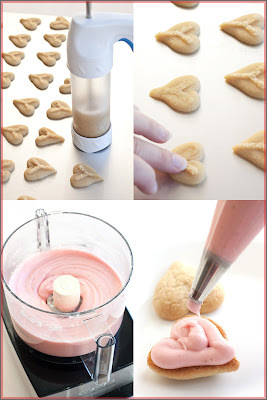 So out came the cookie press for this romantic Valentine’s Day idea. It even comes with a “ahem” romantic suggestion. The cookie press worked even better than I’d hoped for these mini whoopie pies and wow was it fast! I think each sheet took under a minute to press out. It was pure awesomeness. After a five minute bake, a short cool down, filling and a chocolate drizzle, I was still under an hour. I can’t wait to try more "out of season" cookie press ideas. Now I just need a new motive. This recipe was created for the California Strawberry Commission’s Romantic Valentine’s Day Contest. The deadline is Friday, so you still have time to enter . What are you waiting for? Hurry and get your stuff in! Though I’d love to win, I’d be happy if you won instead because I passed the word on. See? I’m a good sharer. I only ask for fifty percent of your Amazon gift card. What? You aren’t a sharer too? Darn. Strawberry soda works just as well, if not better, as a substitute for strawberry sparkling wine. 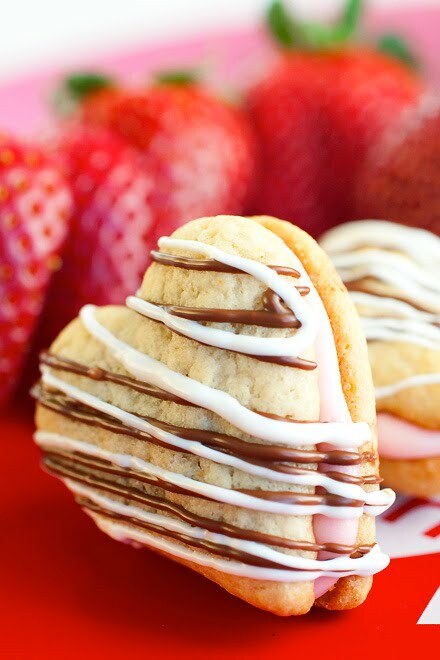 This recipe utilizes a cookie press to make fast, perfectly shaped hearts. 1. Place the oven rack on the center shelf and preheat to 425 degrees. Place a heart shaped disk into a cookie press. Set out three cookie sheets, keeping them away from the oven to stay cool. Do not grease pans. 2. In a stand mixer bowl, beat together shortening, sugar, salt, vanilla extract, egg and yolk. 3. In a small bowl mix together wine or soda, baking power and baking soda. Immediately pour and mix into the batter. Add the flour and beat until just combined. 4. Load the press and press dough o nto baking sheets 1-inch apart. Let the cookie press set for one second each before pulling it off the sheet. With your fingers, pat down the Y-shaped dough sticking up from the cookies. 5. Bake for 4 to 6 minutes until lightly golden brown on top. Watch closely toward the end so they don’t burn. Immediately move cookies to a cooling rack. The key to these cake-like cookies is to let them set up for several hours in the refrigerator before serving. 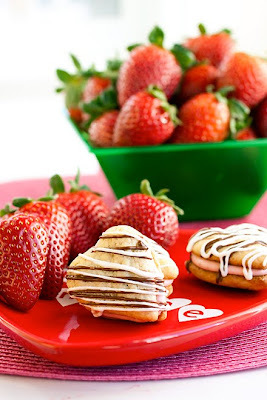 The filling will soften the cookies and the strawberry flavor will further develop. Puree the ingredients in a food processor for 1 minute stopping to scrape the bowl as needed. Pipe filling onto the back sides of half the cookies and top with a matching cookie. Dust cookies in powdered sugar or drizzle with melted chocolate if desired. To melt chocolate: Place 1/2 cup of your favorite chocolate in a bowl. Microwave on high for 30 seconds, stir and repeat until melted and smooth. Place a small round tip into a piping bag and fill with warmed chocolate or drizzle with a spoon over cookies. Note: If your dough won’t stick to your cookie sheets you can freeze the sheets for a few minutes and try again. Recipes and photographs by Laura Flowers. These are simply beautiful. I'm in awe! Suddenly I feel like baking romantic. Amazing,really! These look so delicate and pretty! 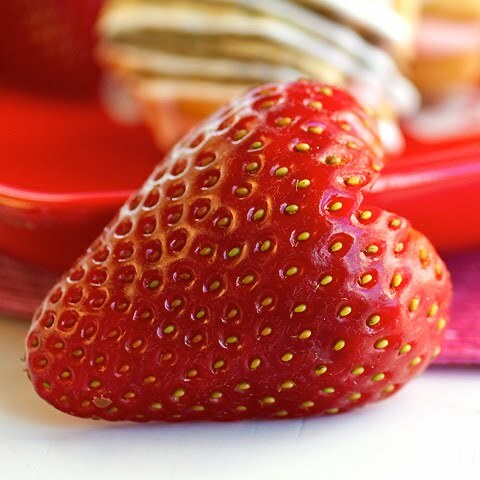 I love your perfect little heart shaped strawberry too:) GOOD LUCK with the contest, Laura! As a Pennsylvanian I remember the days when no one outside of our lovely state had heard of whoopie pies. I'm so glad that they are becoming so popular! I love that these cookies use the spritz gun! Maybe that will entice me to pull it out of the pantry and use it at times other than Christmas! I hope you win!! Great looking photographs. Those are the most perfect looking whoopie pies I've seen. A cookie press seems like exactly the type of thing I need in my life. You could make these for me for V-Day...anyday! I just got a press for Xmas...printed this recipe..so cute! I wish I had a press to make these shapes! Strawberries and champagne are an unbeatable combo and the color is so perfect for Valentine's day coming up! Oh no Riv don't say that. These are just cookies. Fantastic. I love the strawberry sparkling wine ingredient. You are brilliant and this recipe SO deserves to win! This sounds perfect for valentines day! And what beautiful photos! Simply stunning! I hope you win, these are gorgeous and Riv is right. Stop being so modest woman ;) Your recipes and photos are so inspiring! Oh i really hope you win! These are so creative and beautiful! And what a clever name - so appropriate for the occasion. 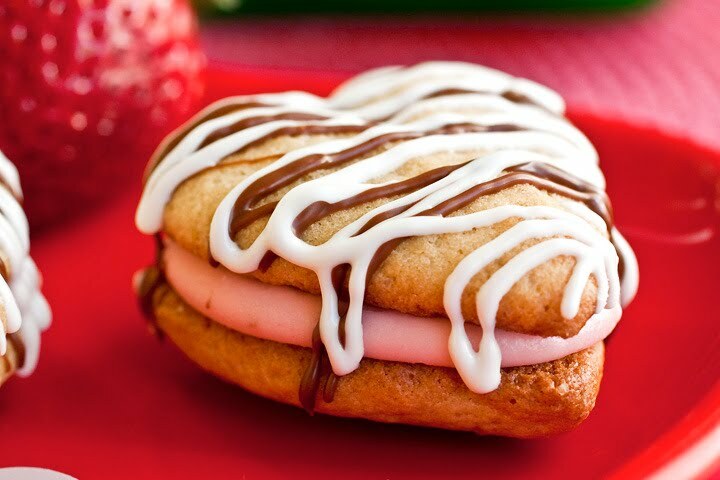 3) any whoopie pie is a friend of mine! i hope you win! i can't imagine what could top this triple threat of a recipe! I broke (don't ask) my cookie press. It wasn't bothering me much before, but now I need to figure out if I can fix it or if I have to run straight to the store to buy a new one! Holy yum! Yum! These look adorably delicious! Jen now I have to ask how you broke your cookie press lol. It would be nice if there was a way to print out JUST the recipe. I hit print post and got all the comments and pictures. Thanks! There is. If you look right before the start of the recipe it says "printer version" in orange. If you click that it will go to another page with only the recipe that you can print out so there's less waste.